Save-On-Food has announced the launch of online shopping pickup and delivery for their locations in the BC Interior and Okanagan. Customers can place orders on the web and via the grocery chain’s iOS app. 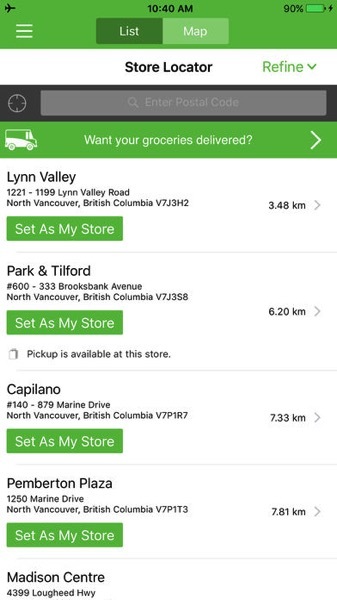 The company confirmed to iPhone in Canada stores in Kelowna (Lakeshore; Cooper; Kane), Prince George (Domano; Central; W. Austin; 15th Ave), and Vernon (27th St.; Highway 6) will now offer pickup or home delivery for groceries. Personal shoppers will even be able to load groceries into customer vehicles are designated pickup parking stalls. Four Save-On-Foods locations in Kamloops (Valleyview, Sahali, Westsyde and Lansdowne) will now offer pickup only, joining the Brocklehurst store, which launched online shopping back on June 2. The pickup services is free, while the first home delivery is free too. After that, delivery charges start at $7.95. In September, Save-On-Foods launched an updated iPhone app for iOS 11, decommissioning an older version. The new version requires a new account to be created, as the old More Rewards login credentials won’t work. December 1: Kelowna, Kamloops and Vernon to debut home delivery. Prince George will debut online grocery pick up on this date. Delivery charges start at $7.95, not $4.95 as earlier stated.